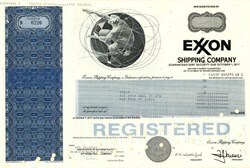 Beautifully engraved certificate from the Exxon Shipping Company issued in 1988. This historic document was printed by the American Banknote Company and has an ornate border around it with a vignette of an allegorical man with geometric lines. This item has the printed signatures of the Company's President and Secretary and is over 18 years old. Punch cancelled. Exxon Shipping Company owned and operated the ill fated tanker, Exxon Valdez. The Exxon Valdez oil spill was the most devastating domestic oil spill in the United States. Its remote location (accessible only by helicopter and boat) made government and industry response efforts difficult and tested existing plans for dealing with such an event. The region was habitat for salmon, sea otters, seals, and sea birds. During the first few days of the spill, heavy sheens of oil, such as the sheen visible in this photograph, covered large areas of the surface of Prince William Sound. Between 11 million and 35 million US gallons (42,000 m�) of crude oil were spilled, affecting 1,900 km of coastline. The Exxon Valdez departed from the Trans Alaska Pipeline terminal at 9:12 pm March 23, 1989. William Murphy, an expert ship's pilot hired to maneuver the 986-foot vessel through the Valdez Narrows, was in control of the wheelhouse. At his side was the captain of the vessel, Joe Hazelwood. Helmsman Harry Claar was steering. After passing through Valdez Narrows, pilot Murphy left the vessel and Captain Hazelwood took over the wheelhouse. The Exxon Valdez encountered icebergs in the shipping lanes and Captain Hazelwood ordered Claar to take the Exxon Valdez out of the shipping lanes to go around the icebergs. He then handed over control of the wheelhouse to Third Mate Gregory Cousins with precise instructions to turn back into the shipping lanes when the tanker reached a certain point. 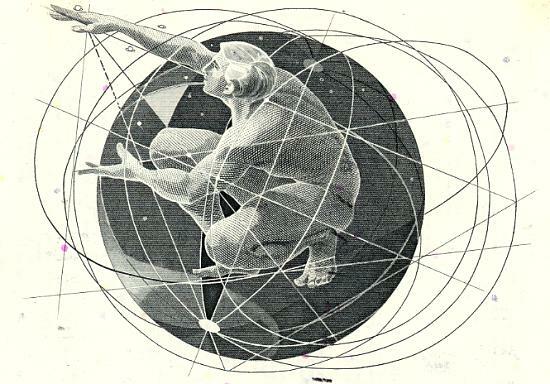 At that time, Claar was replaced by Helmsman Robert Kagan. For reasons that remain unclear, Cousins and Kagan failed to make the turn back into the shipping lanes and the ship ran aground on Bligh Reef at 12:04 am March 24, 1989. Captain Hazelwood was in his quarters at the time. The Exxon Shipping Company was renamed Sea River Shipping Company. The Exxon Valdez was repaired and renamed the Sea River Mediterranean and is used to haul oil across the Atlantic. The ship is prohibited by law from returning to Prince William Sound.